THE billionaire, oil-magnate benefactor of Manchester United's “noisy neighbours”, Sheikh Mansour bin Zayed al-Nahyan, certainly knows his gadgetry, and has been splashing the tech cash accordingly. Chuckling in the face of UEFA's incoming Financial Fair Play laws, an influx of funds has been used to not just hoover up all the best players into the Manchester City team bus but create the most tech-savvy football arena, too. Last year, the club followed Liverpool's lead and installed high-density Wi-Fi at its Etihad stadium. But with the capacity being increased to 62,000 for the 2015-16 season, making it the second largest stadium in the UK behind Old Trafford, it's now raising the bar with a blitzkrieg of new media partnerships to define the future of kickball. 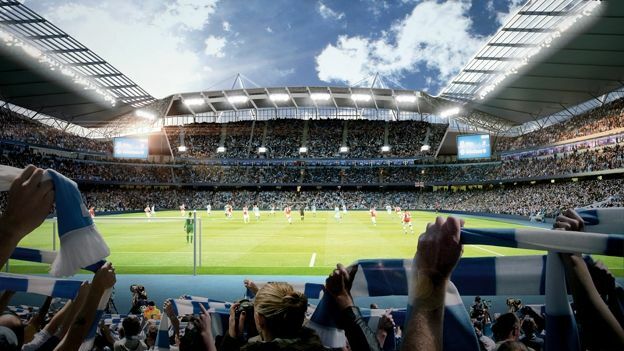 While the traditional turnstiles remain for now, the Etihad is also ushering in contactless smartcard entry, admitting 1,200 fans per minute on match days. It was also the first Premier League club to stick a camera in the player tunnel and beam the unplanned results to the internet in a move of still-unparalleled social genius. Struggle to get even texts to send at your ground of choice on match day? Prepare to feel sick: the Etihad introduced high-density Wi-Fi last year similar to that at Anfield, the Nou Camp and the Bernabéu. The result is 65-72Mbps for streaming goal replays and penalty calls as the match plays in front of you. Hawk-Eye's spycam system costs roughly £250,000 to install and feeds directly into the referee's fancy new watch. Tracking is handled by high frame-rate cameras that monitor the ball and software that triangulates its position in relation to the goal line. Having long utilised Prozone analysis tools, custom Coaching Data software and an entire fleet of in-house IT analysts to maintain their performance, City are building a state-of-the-art £100m academy with 16 training pitches for next season. Current innovations in training kit that could make an appearance are shirt sensors to record blood pressure, hydration and CO2 levels and boots that track ball impact and players' steps, pedometer-style. The Manchester City Connect app already lets fans play a real-time multiplayer game based around the emerging match, part four-in-a-row, part FIFA Ultimate Team. However, Cisco Systems' StadiumVision app, already used by the Brooklyn Nets basketball team, is also incoming. It delivers in-game video on demand across Wi-Fi, letting you watch replays from a variety of angles. Panini stickers with a high-tech twist, these will link to your smartphone and update automatically with the player's social media profile and stats. Tech bugs may take to the air to film the action, with LED lights replacing the intense stadium floodlights for better and more natural visibility at night. Watch the match via holograms beamed from your smartphone? It's just like being at the game, but sans lukewarm Bovril and dubious chanting.